Though not quite as active as it once was, Spotify's Insights blog once offered its artists ideas and information about different industry trends - here we look at a distillation of some of the blog's more salient points. For years now, streaming platforms like Spotify have given musicians a direct line to their fans. Whether you’re represented by a major label, or no label at all, you can reach new listeners and longtime fans just the same. But how to best take advantage of these platforms’ algorithms, and other back-end black magic, seems to be a problem without a clear answer. Spotify’s Insights blog, which isn’t as active as it has been in the past, once aimed to help its users learn about different trends, and give musicians the tools to improve their standing on the service. I’ve taken a look back at a few of the more interesting statistics on the blog and distilled the main learning points, so we can glean what’s helpful to us as musicians on the quest for a larger, steadier stream of listens, and a hopefully greater share of royalties. Right now, Spotify is seeing an explosion in listening diversity. The company defines that term as “the number of artists each listener streams per week.” Spotify attributes this to their robust selection of personalized and curatorial playlists. The variety of music discovery tools on Spotify have caused the average listener to go from listening to 30 artists per week in 2014 to over 40 in 2017. During this same time period, average weekly listening hours per user grew by 25%. This, of course, means that the more artists a listener tunes into, the more time they’ll spend on Spotify, which is good for the company — but it’s also good for musicians. Playlist makers have the ability to move listens from Top 40 artists to indie artists within this new culture of diverse listening, and on a grand scale, that can help spread the revenue generated per stream around more evenly than in the past. I think what we can mainly take away from this blog post is that, firstly, music is not a zero-sum game. What is good for your contemporaries is good for you. It’s tempting to be competitive and try to steal plays away from other artists but, in the end, the more effort you put into generating plays, the more it helps other artists get discovered as well! Using this community aspect to your advantage is wise. Secondly (and this is perhaps a downside depending on your musical output), as listener diversity continues to grow, it’s more advantageous to release singles and short releases than full albums, via Spotify at least. Since people are listening to more artists in a given week, they have less and less time to focus on a single artist’s catalog. Plus, people are becoming more likely to hear about your music from a single song that’s featured on a playlist. + Learn more on Soundfly: Discover unknown royalty and licensing-based revenue streams and how to collect them with Ari Herstand’s new, free course, How to Get All the Royalties You Never Knew Existed! It seems that even if you don’t know what reggaeton is, you’ve likely heard it everywhere. Spotify makes a compelling case that its platform was a major driver of the genre’s explosion. As traditional pop became less popular, world-influenced dance music like reggaeton is becoming even more popular. Spotify is giving a global voice to what were once regional genres. Before, if you weren’t part of the community, you would miss out on its music. Now you can just subscribe to playlists like Baila Reggaeton and be immediately plugged in. “The importance of being part of Spotify’s Baila Reggaeton playlist is that those interested in the genre, as well as existing fans, have access to the latest in reggaeton,” says J Balvin, whose hits “Mi Gente” and “Bobo” were included in Baila Reggaeton on the day of their release. The lessons of this post are a little harder to articulate. Spotify is a force of globalization and it’s bringing people all over the world together over our shared love of good music. I look forward to seeing what musical explosions we will get from Africa, Southeast Asia, South America, and anywhere else with rich musical traditions. You never know when some huge outside force is going to push your own musical creativity in one direction or the other! Make sure you’re always positioning yourself for success, just in case. Which Music Genres Have the Loyalest Fans? This blog post looks to measure which genres have the most loyal fans by seeing how many times fans return to listen to their favorite genres of music. First, Spotify identified each genres’ “core” artists. These are artists who are “staples” or most central to the genre. For example, Johnny Cash or Garth Brooks would be staples of country music, Bob Marley is a staple of reggae, and Iron Maiden and Ozzy Osbourne are staples of metal. Globally, metal fans are the world’s loyalest by a pretty large margin. 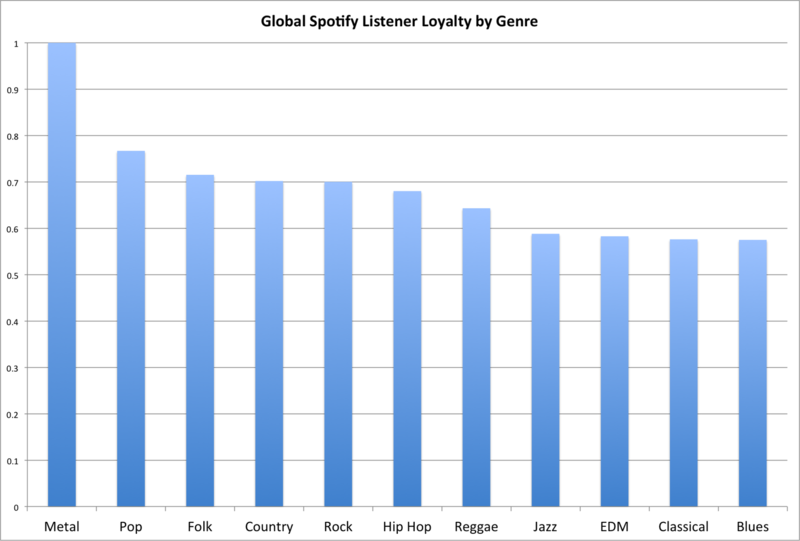 If you’re interested to see how genre loyalty plays out in a ton of different countries around the world, you should click on over to the article, but the biggest takeaway from all that country data is that locally homegrown genres inspire a lot of loyalty. Australian country fans are very loyal in Australia, Brazilian punk fans are the most loyal fans in Brazil, Italian indie pop (followed by Italian pop, Italian folk, and Italian jazz) fans are the most loyal in Italy, etc. That’s probably obvious, but there are two important takeaways from this. Firstly, you should probably pay attention to where you are when you’re making music, and it might be wise to borrow from some of the traditional songcraft styles, even if you don’t plan to release music in that genre. If you want listeners to come back time and time again, make sure you’re targeting the right listeners. Secondly, there is so much amazing music out there that people are very passionate about that we don’t necessarily get exposed to in the American mainstream. Check out some of these foreign genres and see what all the fuss is about!